A 51-year-old white man was arrested Saturday after punching an 11-year-old black girl in the face during an incident outside of a mall in Asheville, North Carolina, authorities say. 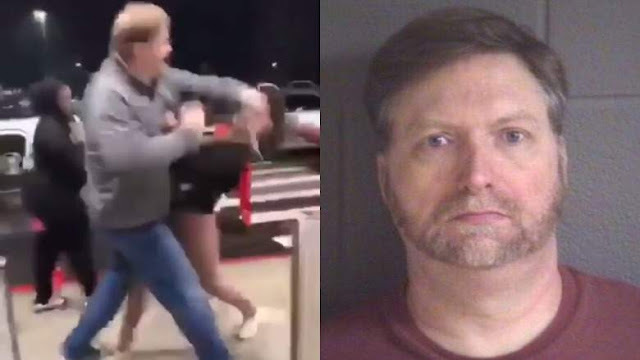 David Steven Bell was caught on video striking the girl in the face with a punch, sending her to the ground at the Asheville Mall. David Bell was taken into custody by the Asheville Police Department and charged with assault on a female under the age of 12 and two counts of assault on a female, according to records and the Asheville Citizen-Times. The girl was not taken to the hospital, police told the Citizen-Times. Bell has been released from custody. He could not be reached for comment by Heavy and it is not clear if he has hired an attorney. Video of the incident was posted on Instagram and Facebook on Saturday and quickly went viral on Sunday. The girl who was the victim of the assault has not been identified and has not spoken out about what happened. The Asheville Mall said in a statement that the incident remains under investigation by police. David Steven Bell can be seen in the video, initially posted to Instagram by an unidentified person, in an argument with a group of young girls outside of the Asheville Mall. You can watch the video above. The incident occurred on Saturday, January 12. Bell is white and most of the girls in the video are black. It is not clear what occurred before the video started. In the video, Bell can be heard yelling to the girls to “break it up.” As other girls yell at him, one can be heard asking, “who is he?” Bell walks menacingly at the girls and they appear to back off. One girl then pushes Bell in the back, barely shifting his balance. As the girl walks toward Bell, he shoves her backward, sending her into a metal pole and nearly to the ground. The girl gets back up and Bell punches with a closed fist, knocking the girl out and down to the ground. The other girls then run away screaming as the video ends. Online jail records show that Bell is 6 foot 5 inches tall and weighs 250 pounds. According to the Asheville-Citizen Times, the incident occurred about 7 p.m. at the Asheville Mall. Police spokeswoman Christina Hallingse told the newspaper that an off-duty officer who was already at the mall arrested Bell after the incident. The girl declined medical treatment and was not taken to the hospital, Hallingse told the Citizen-Times. David Steven Bell is a resident of Black Mountain, North Carolina, according to public records and his social media profiles. Bell is married and has two children, a 20-year-old son and a teen daughter. Bell was released from the Buncombe County jail just after 1 a.m. Sunday, records show. It is not clear how much bail he was required to post to secure his release. It is also not known when he is scheduled to appear in court for the first time. The charges he faces are all misdemeanors. Bell was charged with assault on a female under the age of 12 and two counts of assault on a female. Both charges are class A1 misdemeanors, the most serious level for a misdemeanor charge in North Carolina. If convicted, he could face up to 150 days in jail per charge. But with no apparent previous criminal record, it is unlikely he would be sentenced to the maximum. The Asheville Police told the Citizen-Times that the incident remains under investigation. It is not clear if additional charges could be filed against David Steven Bell.